The Birmingham Museum of Art has always been my museum. It has been there, across the street from the north end of downtown’s Linn Park, as long as I can remember. It’s the first museum I knew; I still remember my first visit on a Sunday afternoon with Mother, Aunt Polly, and a cousin when I was about 7-years-old. When Dad’s office was downtown, I would occasionally go to work with him and idle away a morning or afternoon in the museum collection. Since then, I have always felt at home there. Even when I lived far away from Birmingham I would try to work a visit to the museum into each trip home. 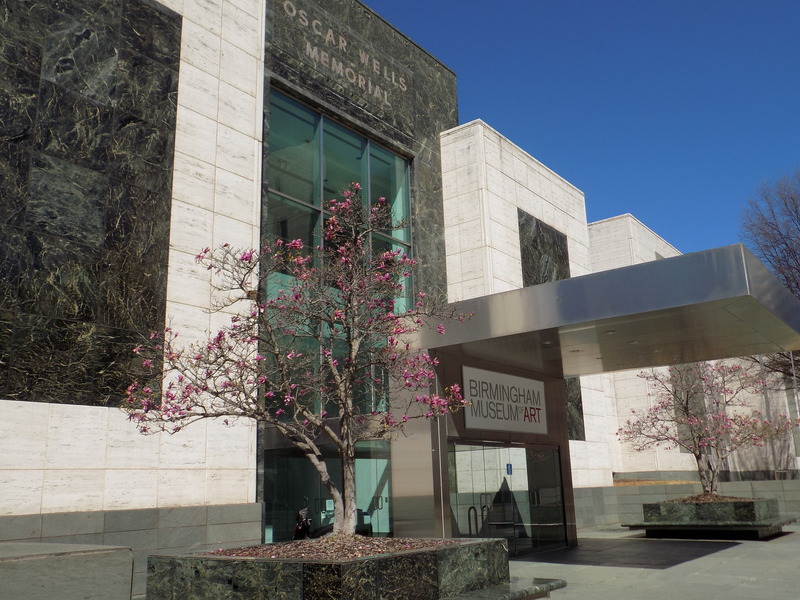 Beyond my sentimental attachment, the Birmingham Museum of Art is also an excellent museum with an impressive and wide-ranging collection ranging from African, Asian, Native American, and Pre-Columbian Art to American, contemporary, folk, European, and decorative arts. 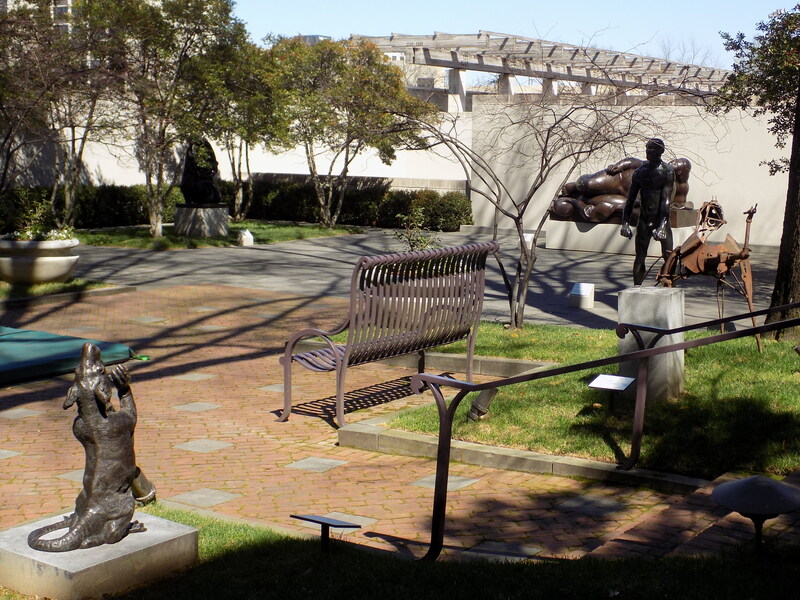 One of my favorite places at the museum is a multi-level sculpture garden where I like to be at any time of the year. I didn’t appreciate how good the Birmingham museum was until I started traveling around the country and visiting other museums. Most importantly, the Birmingham Museum is a city-owned museum that is still free to the public (except for the occasional special exhibition). 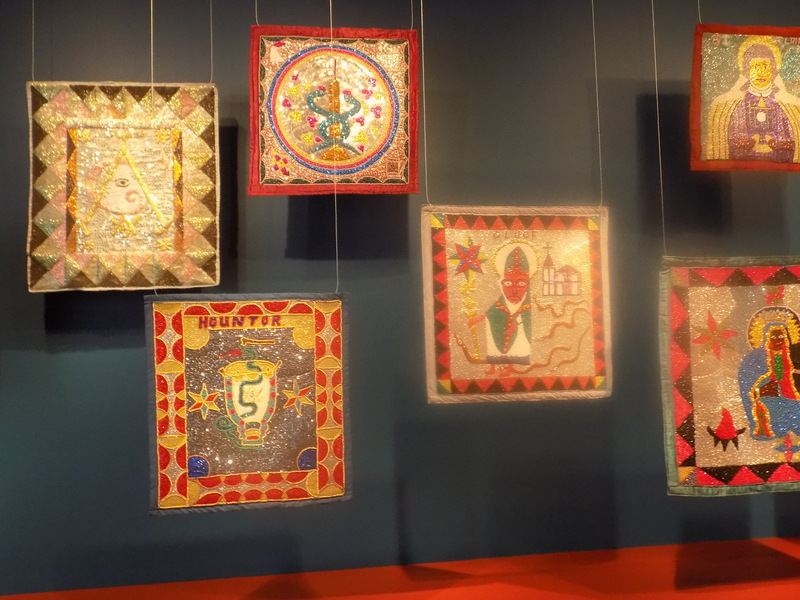 I spent the morning there visiting a current exhibit, “Haitian Vodou Flags from the Cargo Collection.” The small but impressive exhibition is shown in a dark room with lights highlighting the colorful flags and accompanied by video of a Haitian Vodou ceremony. Vodou was a religion established with the Africans’ arrival in Haiti in the 1500s; because Vodou was outlawed by the European colonial powers, it was practiced in secret and evolved to include Catholic saints and symbols along with the loa – Vodou spirits. There are links with American “voodoo” but Haitian Vodou has distinctions which set it apart from the American tradition most identified with New Orleans. The flags on display are generally colorful square patches bedazzled with beads and sequins. As evidenced in the video, the flags may be hung, flown, or draped over the shoulders and backs of celebrants. Images combine iconography of Christian, African, and Masonic traditions and recognizable types include a Madonna and St. Patrick, snakes writhing at his feet. The textiles are stunning in intricacy, vibrance, and design detail. I hope I was a good tenant; I think I was. But once I threw a party at my place on the Saturday night of Labor Day weekend and some of the party-goers got the bright idea to go down the street and t.p. writer Barry Hannah’s front yard. I didn’t hear about the escapade until after the fact; I expected to get an earful about it from Mrs. Cargo first and Barry second but fortunately I never got the reprimand from either source. Not long after I moved on from the Caplewood house, Robert Cargo Folk Art Gallery opened up on 6th Street in downtown Tuscaloosa. The Cargos were important collectors of folk and outsider art – I had admired some of their pieces on the very few occasions I had been in their house – and the downtown storefront provided a place to share the collection, interact with dealers, and continue acquisitions. The Robert and Helen Cargo African American Quilt Collection was probably the most notable part of the impressive collection. Robert Cargo died in 2012, preceded by Helen Cargo a few years earlier. A year after Dr. Cargo’s death, their daughter Caroline donated approximately 700 items of the Robert Cargo Folk Art Collection and the quilt collection to the Birmingham Museum of Art. The gift included over 75 Vodou flags the Cargos collected from the makers over the course of several trips to Haiti during the 80s and 90s. Many of those flags are included in the current exhibit. Over the twenty years the Cargo Folk Art Gallery was open in downtown Tuscaloosa, I had visited and was well aware of the impressive quilt collection and numerous other works of folk and outsider art but the Vodou flags were unknown to me until the museum announced the current exhibition. Robert and Helen Cargo were gracious people and passionate collectors. It was good to remember them and commune with their spirits today at my favorite museum amidst some of the objects they collected and loved. 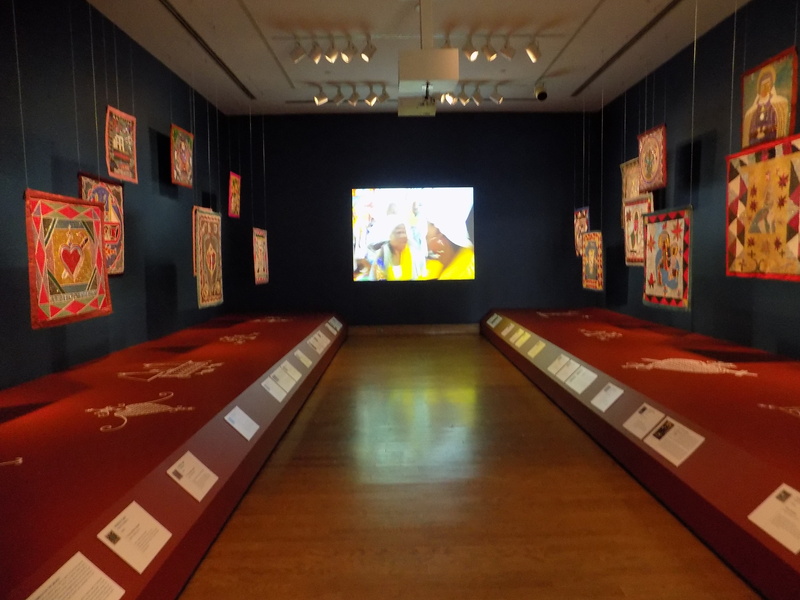 This entry was posted in Birmingham (AL) Museum of Art and tagged Barry Hannah, Birmingham Museum of Art, Haitian Vodou Flags, Robert and Helen Cargo African American Quilt Collection, Robert Cargo Fol Art Collection, Robert Cargo Folk Art Gallery, The Chukker, Vodou on March 6, 2016 by gedwardjourney.